We care for more than half a million children and teens every year. Our number one priority is to support you and your family. Whether treating a toddler during an emergency, or helping a teen through chemotherapy treatments, we make it our mission to provide the best care—and best experience—for every child. At Children's Healthcare of Atlanta, we are 100 percent committed to kids. We’re fully equipped to diagnose, treat and support your child. Our pediatric doctors, specialists and nurses understand that children’s medical and emotional needs are different from adults. We use specialized equipment and techniques to provide the care kids need to thrive. Every member of our team has just one focus—help kids and teens get better faster, so they can go home sooner. No matter what your child’s health condition, you can be confident in our experience and skill in treating it. We provide world-class care in more than 70 pediatric specialties. Family is a big part of your child’s well-being. Not only are you a vital member of their healthcare team, you are a source of security and comfort. That is why we work to support your whole family while your child is in our care—and after they go home. Constant access. 24-hour family visitation, including in our intensive care units. A place for you. Sleeping rooms, showers, business centers and more for you and your family. Extended-stay accommodations. Local accommodations available through the Mason House and Ronald McDonald house. Play areas. In-hospital playrooms, so your child can enjoy time with siblings and other children. Activities. Events that give your child a chance to have some fun—like swimming, crafts, team sports and programs for teens to socialize. Laughter. Humorology Atlanta administers a healthy dose of laughter to patients, families and visitors. School support. An accredited hospital-based school program that helps your child complete school assignments and keep up with classes. Family support groups. Support groups for families dealing with medical issues including asthma, cancer, blood disorders, heart conditions, diabetes and transplants. 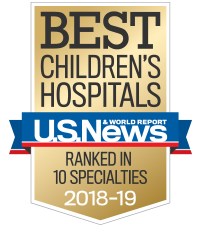 Children are our most precious gifts, so we at Children's Healthcare of Atlanta thank you for trusting us with your child's care. We understand how serious this responsibility is, and work every day to give the best care to our patients and their families. At Children’s, we care for more than half a million children and teens every year. We are the largest pediatric provider in Georgia—and one of the largest in the country.